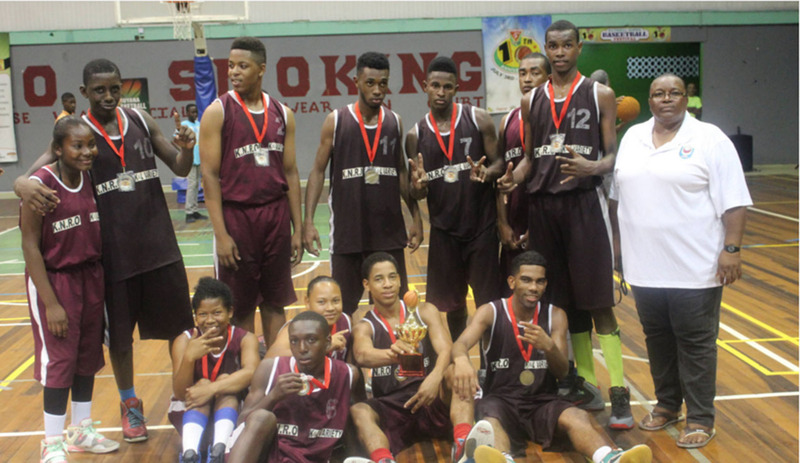 Kwakwani Secondary were crowned the Youth Basketball Guyana (YBG) Titan Bowl u-19 champions, squeaking past Government Technical Institute by a 75-70 score line on Sunday at the Cliff Anderson Sports Hall. The Victorious Kwakwani Secondary posing for a photo opportunity following their hard-fought win over GTI in the YBG Titan Bowl u-19 Championship finale. Stanton Rose led Kwakwani with a double-double of 20 points, 10 rebounds and five steals while Damair Gladstone was the next best scorer with 18 points and six steals. Assisting with a double-double of 10 points and 11 rebounds was Jamal Gilkes while Kerrol Phillips recorded 10 points and six rebounds. For the loser, Nathan Saul recorded a double-double of match high 23 points, 16 rebounds and four assists while Sebastian Luke supported with 20 points and eight rebounds. Saul for his showing in the event, was adjudged the eventual tourney’s most valuable player (MVP) with a tourney average of 22 points and 10 rebounds per match. In the earlier semi-final round, Kwakwani defeated Linden Technical Institute 47-31. Troy David top scored with 15 points while Rose supported with 11 points. For LTI, Tahquille Johnson and Ron Profitt netted 13 and nine points respectively. The second semi-final witnessed GTI dismissing New Amsterdam Multilateral 58-31. Saul recorded 29 points and six rebounds in the win while the duo of Luke and Malcolm Powdar chipped in with 10 points apiece. Tops scoring for the Berbicians was Sherland Gillis with 13 points and seven rebounds.